The latest of the frequent duo exhibitions at Center of the Earth Gallery is dominated by an artist new to the gallery and to Charlotte. Louis St.Lewis had one mixed media piece in a group show earlier this year, but otherwise this is his first Charlotte exhibit. The Chapel Hill artist works in different media, and his fundamental artistic strategy involves appropriating and refashioning scavenged images to create unabashedly gaudy works, combining references to pop culture with evocations of religion and mythology. "Flamboyant" is the best word to describe his art. He uses lurid colors, big flowers, grandiose titles, seductive fashion model images and anything else he can find to call as much attention as possible to his brilliant and distinctive mixed-media pieces. The largest of St.Lewis' works is " Apollo and Daphne" which includes painted passages, but is in essence a large scale collage. In his rendition of the Greek myth, Daphne's eyes are shut and she holds and Egyptian ankh symbol in her left hand as she leans to one side , looking stiff as a board- the artists way of suggesting her transformation into a tree. Apollo grasps her with one hand and hold an arrow to her breast with the other. Most of the component images that make up this piece are transferred directly onto the canvas from photographic imagery that St. Lewis culls from popular magazines and other sources. Among these are the faces and most other physical features of the two central figures, as well as a profusion of peripheral images, including feathers, leaves, flowers, birds, insects and - for some reason- a two dollar bill. The painted passages in high-key shades of yellow, red blue and green serve mainly to fill in the background and the remaining spaces around this found imagery. Several smaller compositions feature this collage-painting mix. Unlike " Apollo and Daphne" however, most of these pieces aren't related to familiar narratives. As a result, they are more ambiguous. They are in effect portraits of imaginary individuals the artist has concocted largely from photographic bits and pieces lifted from commercial sources. Each of these works centers on a single individual whose face and upper torso belong to a fashion model or some other young good looking celebrity. After enlarging the image and transferring it to the canvas, St.lewis elaborates on it with paint and additional imagery he fuses with the figure or applies elsewhere. The effect is to make each portrait as haughty, androgynous and/or sinister as possible. St.Lewis completed these mixed-media pieces by giving them titles evoking various historical and cultural associations. The two most impressive are " The Nagasaki Annunciation" and " The Levitation of Marie Antoinette". In the latter work, part of the logo from a Harper's Bazaar magazine cover can be seen above the central disembodied head, topped by a festive flower bouquet and floating against a sky-blue backdrop. St.Lewis' main artistic strength is not his painting but rather his ability to organize images or objects appropriated from other sources. In his best work, he combines such found materials into carefully ordered compositions with a certain baroque elegance and highlighting juxtapositions that are unusual, incongruous, irreverent or sexually suggestive. His strongest pieces are the smaller unpainted collages, which incorporate cutout paper photo images, as well as photos that have been transferred to clear sheets of glass or plastic. Some of these deal with the themes of sexual desire and sexual display, while others satirize religion and the culture of commodity. Most of them contain references to St.Lewis' thematic touchstones, classical art and mythology. 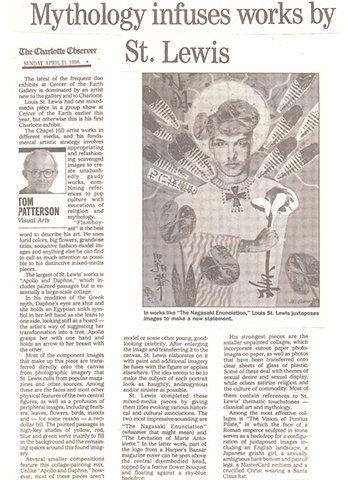 Among the most effective collages is " The vision of Pontius Pilot" in which the face of a Roman emperor sculpted in stone serves as a backdrop for a configuration of juxtaposed images including an English landscape, a Japanese geisha girl, a sexually ambiguous bare bottom and pair of legs, a MasterCard emblem and a crucified Christ wearing a Santa Claus hat.